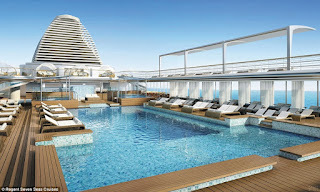 If you have been dreaming about a cruise vacation whether for adventure on the high seas in the Caribbean, or a culture-enriching experience through Europe or any other part of the world, a cruise vacation offers something for everyone and what better way to travel than on the Regent seven seas explorer which is being touted as the most luxurious ship ever built. Launched by cruise line Regent and christened on the 13th day of July 2016, by Princess Charlene of Monaco the explorer’s maiden voyage is scheduled for the 20th of July 2016, this $450 million energy efficient 55,254 gross-registered tons luxury liner will accommodate up to 738 passengers in all-suite, all-balcony accommodation and boasts a wealth of fabulous features on-board. 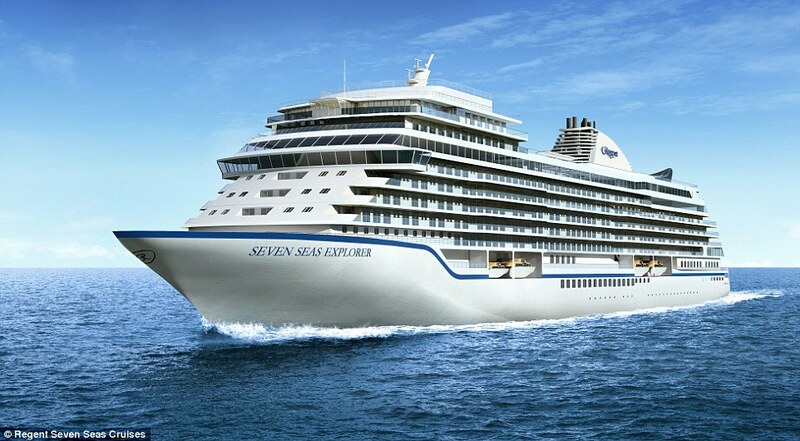 Regent Seven Seas explorer voyages are designed for those who seek the ultimate in luxury and relaxation combined with genuine, authentic discovery in spectacular destinations across the globe. As you step aboard you’ll experience award-winning elegant luxury with all the amenities of larger ships but with an intimate elegant style, truly personal service and world-class gourmet dining which offers an all-open-seating policy to truly set the scene for a relaxed cruising experience and there are a collection of alternative restaurants in addition to the main dining venue, in which guests can choose from an American steakhouse or French haute cuisine. After dinner, guests can choose from a collection of some of the finest bars and lounges at sea to enjoy live music, game tournaments or simply relaxing with like-minded travellers. 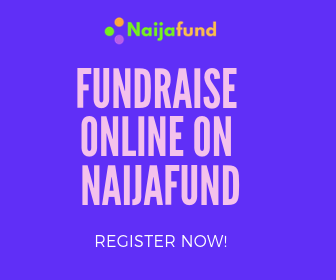 Travellers are offered the best choices in exciting itineries that combine some of the greatest port cities of the world with some of the most remote and beautiful destinations on earth. These amazing destinations are complemented by unique shore excursions and land tours that enable you to travel at your own pace and explore those things which interest you the most. Seven Seas Explorer's palatial 4,443 square feet 2 bedroom Regent Suite features the first in-room spa retreat at sea and a bespoke £112,000 bed. 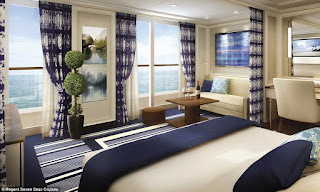 The suite has a balcony that loops around the front of the ship and its own therapy room with ocean-view shower, a pair of heated marble loungers, and a sauna and steam room. The master bed took a year to make and is fitted with a Savoir mattress made from a bred-for-this-purpose horse hair. Fringe benefits include complimentary in-room spa treatments and a luxury car with driver in every port. 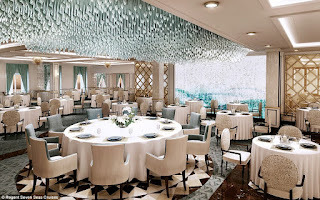 There are also hundreds of luxury guest suites, 5,000 glittering chandeliers, 400 Versace place settings for charger and bread plates and 2,200 pieces of art on board, including a Chagall and a Picasso. On board there is a large teak pool deck lined with comfortable, white lounge chairs around a rectangular swimming pool complete with two heated whirlpools. Above the main pool circular lounge chairs for two with retractable covers can be found. The Pool Bar and Grill will cater for all guests' needs, with the latter serving grilled-to-order burgers, seafood, sandwiches and fresh salad and it has seating for up to 158 passengers. 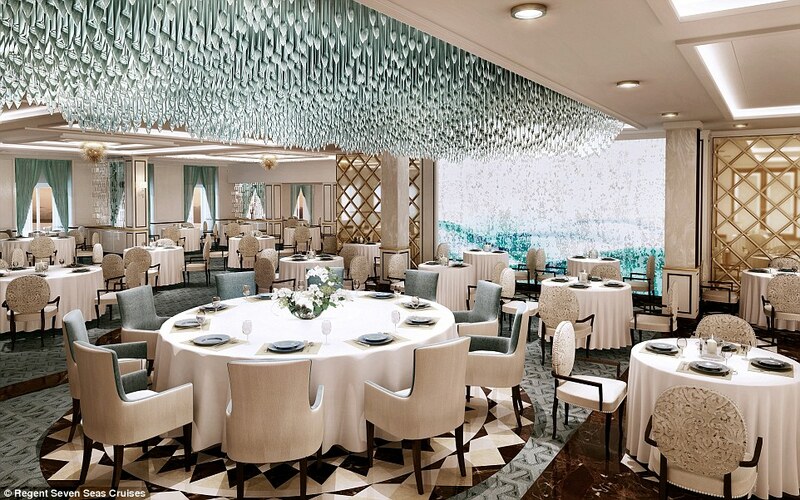 The Meridian Lounge is where cruisers will be able to head for pre-dinner drinks (all of which are included in the fare, both alcoholic and non-alcoholic) and boasts a dance floor and a stage for live musical performances. 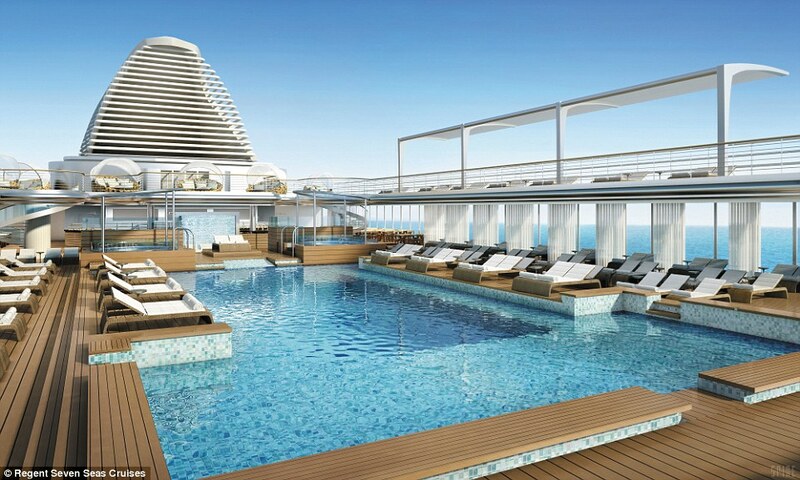 The Observation Lounge provides stunning views of the ship and sea. 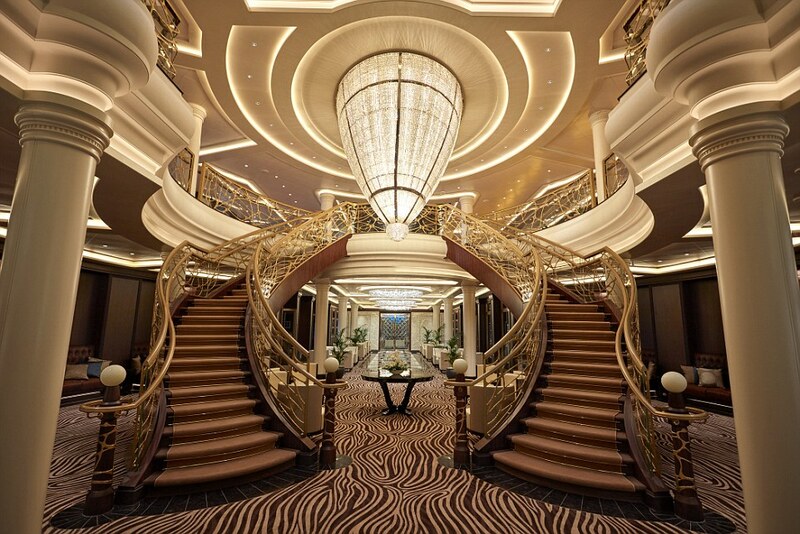 There is a nine-deck high atrium with elegant twin staircases spanning the fourth and fifth floor. 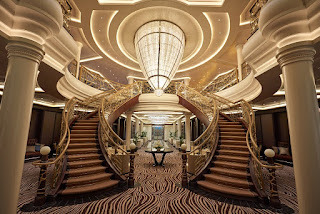 A marble-lined hallway leads passengers from the staircase to the ship's main restaurant, Compass Rose which offers European -inspired Continental dishes in a sea-themed room seating 386 people, complete with a blue, gold, silver and white colour scheme. 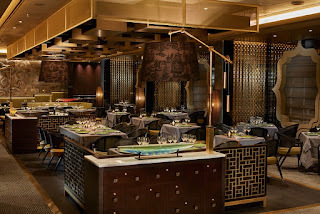 Other dining options include, the chic Parisian-style Chartreuse which serves classic French fare with a modern twist with such dishes as seared scallops with chorizo and roasted milk-fed veal fillet with raspberry and rhubarb marmalade accompanied by sauteed Swiss chard, Prime 7, which is a steakhouse, Pacific Rim, which serves Pan Asian food such as miso black cod wrapped in hoba leaf with pickled daikon and Chinese barbecue pork ribs and Thai green curry. A sports deck is also available, ringed with a jogging track and features a netted area for driving golf balls and an 18- hole putting green that wraps around a paddle tennis court - which also double up as a pickleball court (a mix between badminton, tennis, and ping-pong). For those looking for alternative entertainment, a small casino boasts a dozen slot machines and six table games and a well-stocked library provides a calm nook for guests looking to escape into a good book. Other amenities include a smoking lounge, a soothing, lavishly appointed, state-of-the-art spa, plus salon and gym and a boutique area.